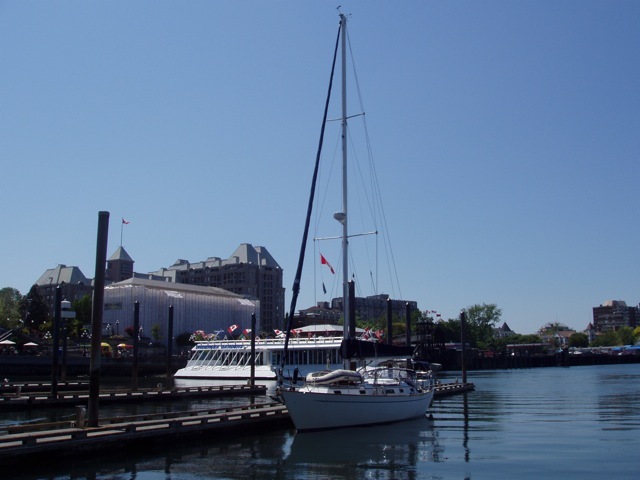 Victoria, more British than any other part of Canada, a Top Ten City of the World, sports a lovely harbor (make that "harbour") area and visitor-friendly surrounds. 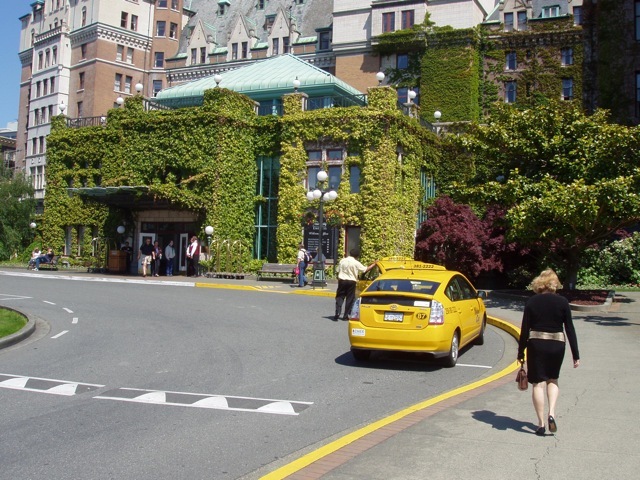 It's also home to the Empress Hotel, the near-legendary hotel built in 1908 and named for the (then) Empress of India, Queen Victoria. 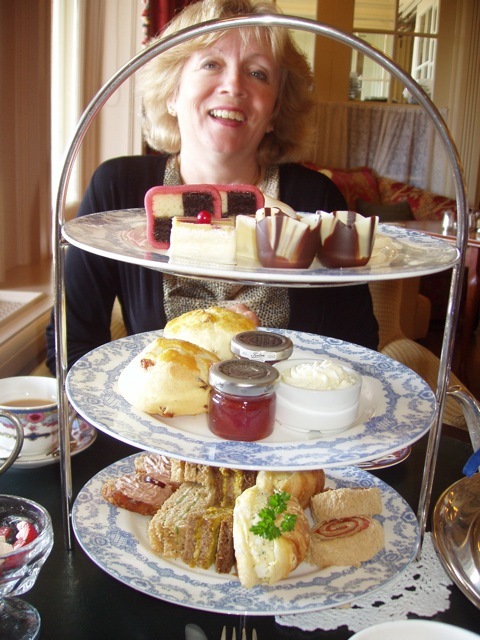 The hotel still serves and celebrates the ceremony of afternoon high tea that draws people from all over the world. We were not immune, and at Conni's insistence Bill dragged on his one good sweater and dark pair of socks just to tone down his usual dissolute appearance. 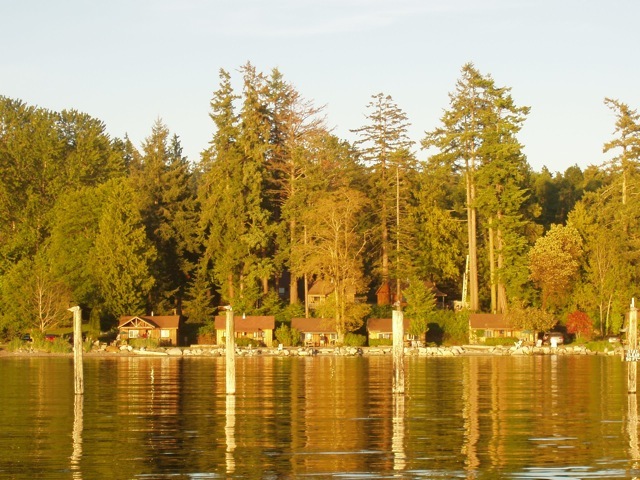 West Beach Resort on the west side of Orcas Island. Wings stayed on a mooring buoy here for two days while we visited our friends, Eric and Susan Goranson, at their lovely house on Orcas. Our last night in West Beach, we stayed aboard. 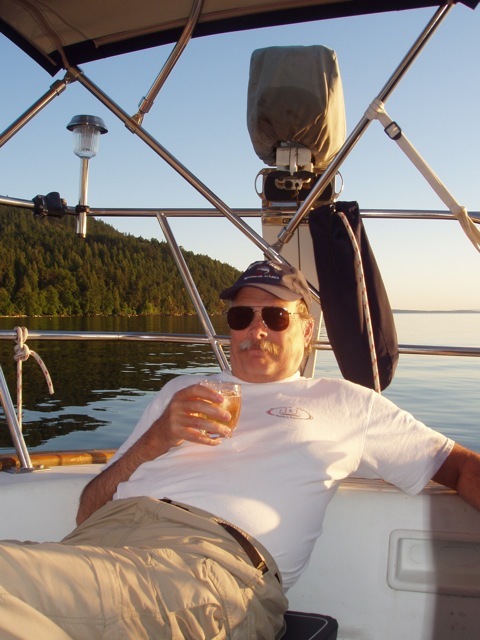 Bill enjoys a cocktail as the sun sets. 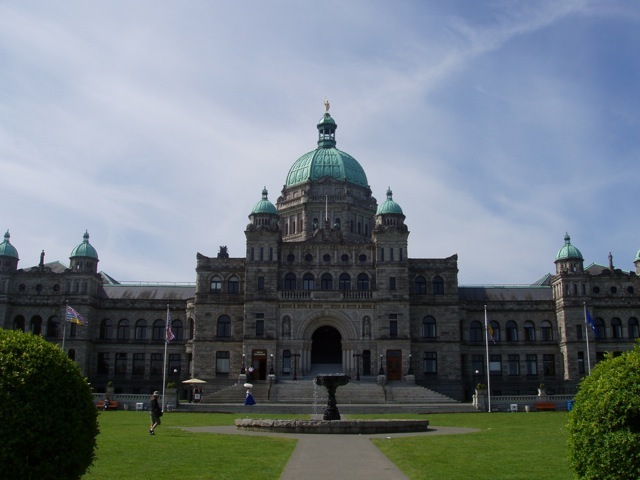 The beautiful British Columbia Parliament building in Victoria, the province's capitol. The large tree (a Coastal Redwood) is the provincial Christmas Tree and is decorated each year. The building is illuminated each night with the silhouette lights. To the left of the tree is a statue of a young Queen Victoria. 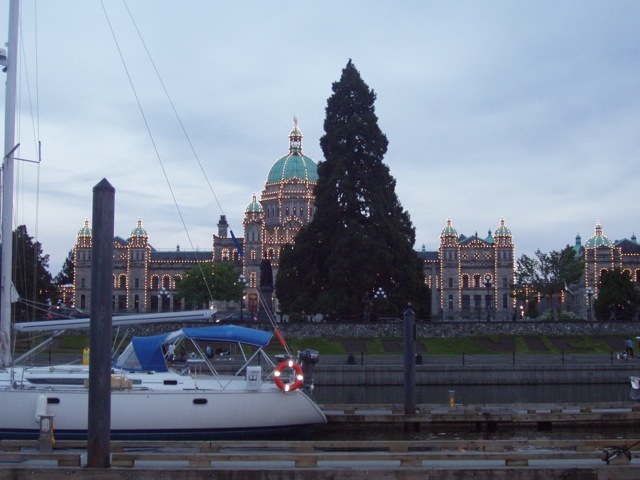 The BC Parliament building was built in 1897 using BC materials. We took a tour of the inside, which is also very pretty. 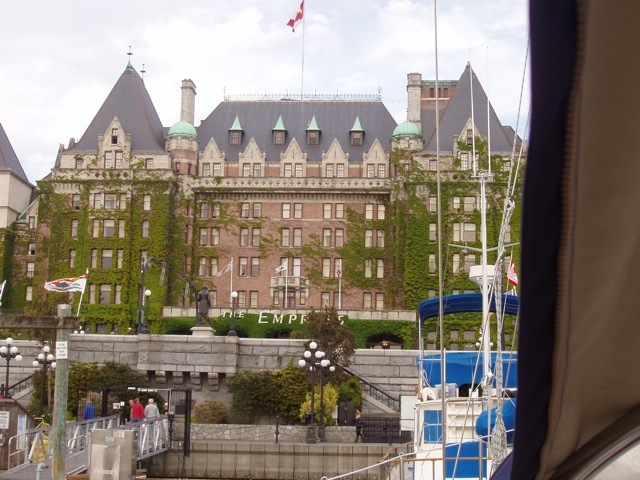 A photo of the front of the Empress Hotel, taken from aboard Wings. Conni wanted to be docked in front, so that's what she got! Wings on her dock in Victoria. It was NOT cheap at $1.50/foot/day plus power. The food offering at tea was more than substantial, with tiny sandwiches, scones, and rich desserts. Everything tasted as good as it looked, and we each had a pot of Empress tea, besides. Only leaves from the tops of the tea plants are used in Empress tea: social commentary in every cup! The china service and cutlery were lovely. 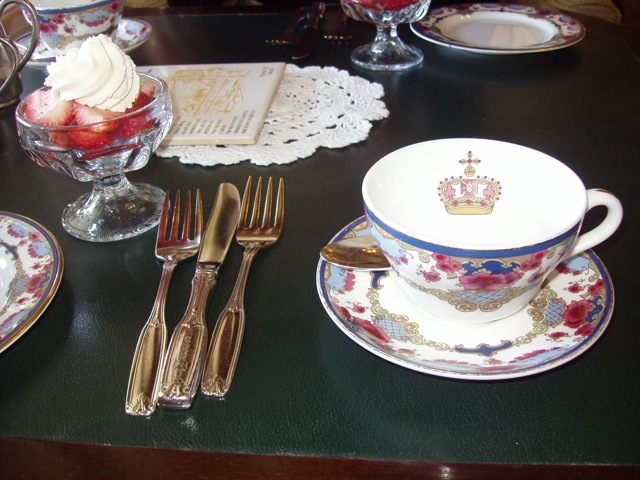 The china pattern is made by Royal Doulton only for the Empress Hotel, and duplicates a pattern in use when the hotel first opened.